If the internet were a brick-and-mortar supermarket, and all digital software was sold as physical packages, you would find the cybersecurity section so overrun with brands that you wouldn’t be able to push your cart through the hundreds of products choking the aisles. For consumers not familiar with the cybersecurity world, discerning the good services from the bad can be an overwhelming task. That’s why the independent lab AV-TEST exists. It’s an informational resource for consumers who need objective advice on the best cybersecurity products. In March 2018, the lab focused on researching the best antivirus for Android devices. A timely endeavor, to be sure — smartphones and mobile devices have grown into prime targets for cybercriminals over this past year. Continuing our visualization exercises from above, if each mobile cyber attack were a bumblebee, you’d be walking around with a thick swarm buzzing around your device wherever you go. AV-TEST examined 20 leading-brand mobile security products, which included AVG Antivirus Free. The tests revolved around the areas of detection, performance, and false warnings, as well as additional features and security layers. For a security product to be strong in protection, it must first be sharp in detection. AV-TEST challenged AVG with over 3,000 samples of real-world malware discovered over the previous four weeks, and AVG detected 100% of them. The lab also attacked the device with over 3,000 samples of other Android malware, tasking the security software to detect them in real-time scenarios. AVG caught 99.9% of those. With a detection rate better than industry average, AVG earned a perfect score on this section of the test. Another important factor of your cybersecurity is performance compromise — as in, you do NOT want your device’s performance compromised. A crackerjack antivirus is not much help if slows your phone’s response time down to a crawl. AV-TEST looked for slowdowns, battery drain, and traffic creation, and found that AVG Antivirus Free did none of those things. The software does its job without any noticeable sap of the device’s power. These occur when your antivirus mistakenly thinks safe programs are malicious. Letting the right files in is just as important as keeping the bad ones out. AV-TEST launched over 2,000 legitimate files from the Google Play Store and other third-party app stores at the device, and whereas the industry average was 10 false warnings, AVG had zero. Coupled with the performance part of the test, this gave AVG a perfect score in the area of usability. Additional security features and extra layers reinforce your defenses. 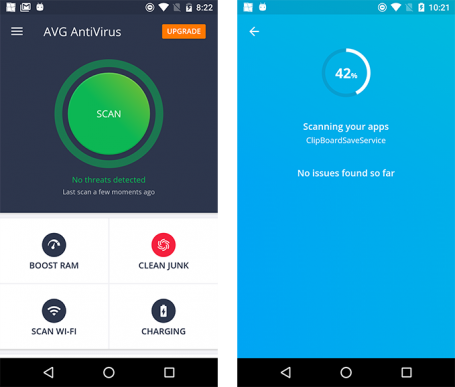 The lab called attention to several of AVG’s bells and whistles: the anti-theft feature of locating, locking, or wiping your device remotely, call blocker, app lock, and Wi-Fi security. If you’d like to read more about the AV-TEST evaluation, check out the full report.